Magical Marriage Lunatics Character Introductions – Meet Karin! Today we’re introducing Karin, one of the otherworldly princesses you will meet in Magical Marriage Lunatics! The lively and boisterous Karin enjoys eating all sorts of delicacies, and even formed a pact with Yuta over a delicious helping of inari after he saved her many years ago from bullies. She gets scolded on numerous occasions by her friend Luci for eating too much, but it’s understandable since Karin requires large amounts of calories to maintain her human form. Her grammy has entrusted her with an important task, yet Karin’s aloof nature leads her to forget even the simplest of matters. Beating around the bush with Karin is a fool’s errand, so her friends make sure to be direct with her whenever possible. Karin is not as smart as her other peers, but with some coaxing from Yuta, she is able to attend school with the rest of the otherworldly princesses. Karin learns to be patient and relax while at school due to all the rules imposed on her. Karin can communicate with wild animals to a certain extent, though their thoughts are unclear and unfocused. Although her mother died at a young age, Karin still does her best to be cheerful around her friends, and rarely gives any indication that she’s feelings sad. 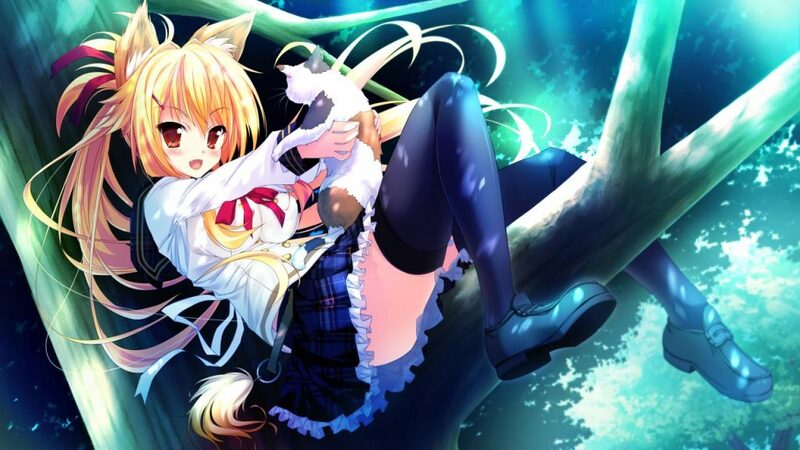 When Karin reverts to her fox form, Yuta and her friends urge her to visit her grammy to find out what’s wrong. Karin will have nothing do with it, as she’s terrified of her strict and old-fashioned relative. After meeting her grammy, Karin learns about the ritual dance of the tenko, a performance that allows tenkos to remain in human form while paired up with a human. Karin despairs at the herculean effort she will have to put in to pull off a successful performance. Nevertheless, she relents upon realizing it’s the only way she can stay with Yuta. Will Karin be able to salvage her human form? How much is she willing to change for the person she loves, even if it comes at a hefty price? When love is not enough to bridge two worlds together, will Yuta and Karin find the inner strength to persevere? Dating a quirky tenko is a blast but comes with its own set of tribulations. The culmination to this stormy matrimony can be yours if you are willing to take the plunge and meet the heroines inhabiting the colorful world of Magical Marriage Lunatics! 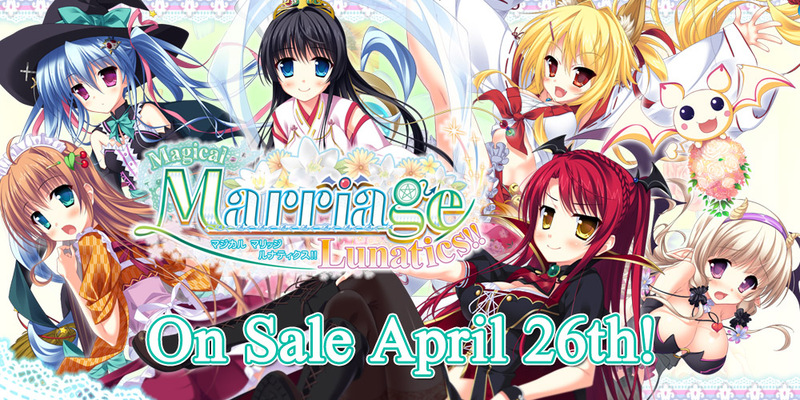 Magical Marriage Lunatics is now available for pre-order! On sale 4/26 on MangaGamer.com! Tagged magical marriage lunatics, moonstone. « The House in Fata Morgana Physical Edition (and OST!) Now Available for Pre-order!